Check out our new iPad kiosk, the first and only iPad kiosk approved by Apple®! Arc Design is a design consultancy specializing in interactive kiosk design, custom kiosk design, interactive retail displays and retail fixturing. What we do: eye-catching, innovative designs that make people want to interact. What we don't do: boring boxes that people walk past without a second thought. How we do it: We use accredited product designers to design our solutions as opposed to mechanical engineers. 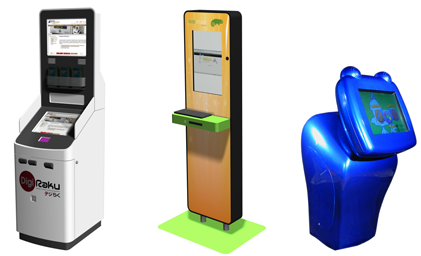 Being an independent design consultancy Arc Design is free to design to suit the kiosk deployer's needs as opposed to the kiosk fabricator's production capabilities. This results in more eye-catching, unique and cost-competitive solutions than fabrication firms who rely on their sheet-metal engineers to design their products. Who would you rely on to design your home; an architect or a general contractor? Check out our portfolio, we think the work speaks for itself.